$8.95 Flat Rate Shipping: Stock up on all the honey goodies you can get for one flat shipping rate! Applies to UPS Ground shipments to one continental US address. * Each additional address shipped to will receive an $8.95 shipping charge. ** 12 lb and 40 lb Buckets will have an $8.95 charge per bucket. Shipping to more than one address? Don't worry, bee happy! Go ahead and pick all of your items out now and distribute them to each individual address while checking out. The bees are always trying to make things easier for you. Honeyville strives to get your order out the door and on its way to you as soon as possible. Internet and phone orders placed before 3:00 PM Mountain Time usually ship the same day the order is placed. During the busy Holiday Season some orders may not ship the same day due to the large volume of orders. What carrier will be delivering my package? 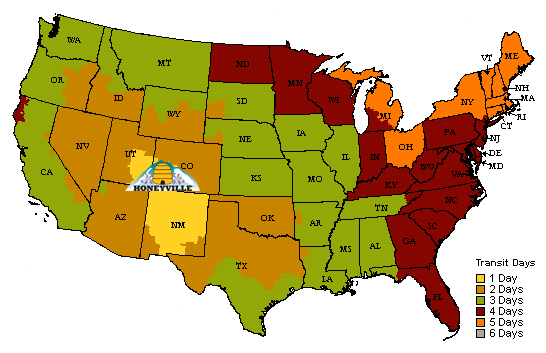 Can Honeyville products be shipped year round? All Honeyville products can be shipped year round, but hot and cold weather can have an effect on Honeyville Specialty Whipped Honeys. Will Gifts contain paperwork showing the prices? All gifts sent from Honeyville will NOT include any kind of pricing. Only a packing slip and a personalized message (filled out during checkout) will be included with any gifts. How much does it cost to ship Wedding Favors? Wedding favors cost $8.95 to all continental United States locations. Please call 800-676-7690 for any shipments outside of the continental United States for a shipping price. If you have any other questions please call our customer service team at 800-676-7690.